Having been raised in the North, I know that no two snowflakes are ever the same. I have now learned that the millions of seashells that wash up on the beaches of southwest Florida share that same trait. No two are exactly alike. 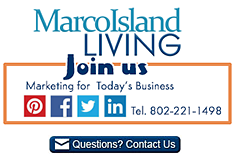 Having said this, I now understand why the quest to find exotic and beautiful shells captures so many visitors to southwest gulf coast Florida and especially Marco Island. Adults and children alike just love poking through the white sands of southwest Florida to find nature’s treasures. Hundreds of people scour the beaches daily to see what high tide has provided today. People are so excited about shelling that there are many boat excursions and boat rentals that take you to the unoccupied islands around Marco Island and Naples so that you can bring back bags and bags of these shell. With nearly 100 barrier islands in this gulf coast area, shelling has turned into a big business. However, many overenthusiastic shell collectors find themselves with an overload of shells that they have no use for. Shells can be a smelly and dirty business, especially when the creature that lived in the shell has died but still remains inside. Many condo and hotels do not allow you to wash shells inside. Always make sure that you do not have live shells. 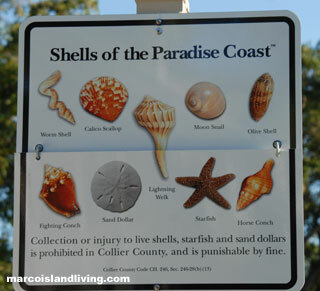 Live shelling is banned on these islands, so please be careful not to destroy wildlife. 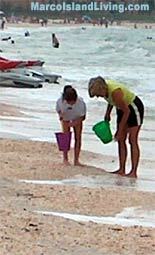 Shelling is best done at low tide. Pockets of sand that are created when the tides come in that leave pools also leave larger deposits of shells. There are over 400 species of shells. Many people purchase handbooks that can identify the shells. When collecting the shells, small plastic bags are good for the more delicate shells. Large mesh bags can easily be rinsed out in the salt water and then again in the outdoor water washes provided at most the beaches. When collecting shells, also consider what you will do with them and how you will get them home. Shells can weigh a great deal – select only what you need to ship or take with. You can return the rest to their natural habitat. 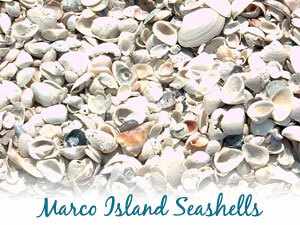 Ask us about Shelling in the 10,000 Island of south Florida or share comments. To feature your business, contact us. Experience some of the best charter boat tours south Florida has to offer. Our captains have 30+ years of experience to help make your Naples / Marco Island sight-seeing, nature viewing or shelling trip one to remember. Let Double R's take you to an uninhabited island where you may collect shells from the Gulf of Mexico. Fishing, dolphin and manatee views tours also available.